Sure, you’re focused on getting visibility for your website or brand right now, but what long-term SEO strategies should you consider for the rest of 2013 and beyond? During day three of SMX some of search’s biggest names gathered for the panel, “What’s Needed For SEO Success In 2013 & Beyond?” to discuss the future of SEO and what marketers should do to maintain visibility. Danny Sullivan monitored a panel including Google’s Matt Cutts, Bing’s Duane Forrester and well-known SEO experts Annie Cushing, Rae Hoffman, Janet Driscoll Miller and Greg Boser. They shared insights on what to watch in search, and a theme is clear: You’re a marketer first, and SEO comes second. How users interact with your content and brand across the web is more important than ranking (and positive UX will naturally boost visibility). Will Authorship be the new PageRank? Matt Cutts: Over time, Google will care more about identity and social reputation. Plus, authorship gives you a picture next to your content and we know people click more when they see images. Greg Boser: The topical focus of [a potential AuthorRank] is something PageRank misses. Danny Sullivan is super authoritative on search topics, but should he rank for unrelated things? The right type of authority should rank for different topics. Matt Cutts: It’s harder to fake authorship than buy links. Greg Boser: This will be a good thing for writers – it’s an incentive to pay good writers to contribute to your site. Annie Cushing: This is a call to come out of the shadows and move away from anonymity. Getting a picture near a rich snippet in search is huge – even if you’re No.6 instead of No.1. Matt Cutts: Our guidelines say avoid deceptive practices. On the positive side, it encourages personal brand building. Duane Forrester: On the internet, there are a ton of people who are authoritative, but aren’t affiliated with a brand and deserve recognition. Greg Boser: There are certain domains that are consistently known for putting out great content. If a content writer gets a gig for a great domain, her authority will probably develop more quickly. At the same time, trusted authors can boost the authority of new sites. Matt Cutts: Individuals can absolutely become brands. If you can put out creative content, the moms and pops of the world can become great brands. Danny Sullivan: Brands aren’t just the Cokes of the world. A site that’s iPhoneCovers.com isn’t a brand if it’s doing what Amazon does, but it can become a brand if it gives users info on the newest covers or insights on the benefits of one cover versus another. Search engines don’t favor “big” brands, they favor information and authority that can stand on its own. Greg Boser: Smaller brands are at an advantage. The bigger brands are struggling with the legality of Authorship. By the time the big brands figure it out, smaller companies can move into this Authorship space. Authorship is driven by text, but what about new media content, like video, that deserves authorship? Matt Cutts: The majority of content we see on the web is written text, but there are certainly other types of content and over time Google wants to be able to understand all authority. Greg Boser: Google is trying to get you to consolidate your identity across the web. The days of anonymity are gone. Duane Forrester: People used to hide online, and now we’re moving away from that. If I say something that’s wrong, someone will correct me – and let’s move forward. If I say something great, then I’ll benefit. Take this opportunity to put your name to content and say this is my niche, this is what I know – don’t worry about being “the expert,” readers and responses will help determine that. Annie Cushing: Developing a brand is about accountability. It’s easier to return a pair of shoes to Zappos than return them to an unknown site – I’d rather do business with brands that are trustworthy. Companies have to focus on making themselves accountable brands. Will links as a ranking signal go away? Matt Cutts: Links still have many, many good years ahead of them. The gap where you can do black hat stuff and succeed is getting smaller and smaller. I think we’re doing a pretty good job of spotting link networks and the like. Danny Sullivan: But do people who aren’t at SMX or who don’t care about SEO have SEO-focused blogs or think about links? Matt Cutts: There are 2 billion people online. A lot of people link regardless of whether it has SEO value. Rae Hoffman: But who takes the top spots for commercial queries? It’s people who DO care about SEO. 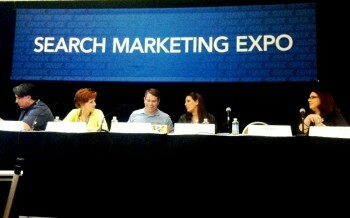 Matt Cutts: There are some very long tail searches or ideas – and there is a lot of room for small businesses to rank. Greg Boser: And normal people don’t use exact match anchor text. Matt Cutts: It’s easier to be real than to fake being real with links. Sites that come out on top, Facebook, Twitter, Pinterest, etc. didn’t think about SEO – they thought about how to build great user experiences. Is social the democratic link building? Will social eclipse links? Duane Forrester: Social and links will hit an equilibrium. Social gives you insight into the psychology of individuals and groups. There are a lot of people working to figure out social signals at Bing. Social reveals intent, we’ll see how it influences search. Matt Cutts: We like standards that are available on the open web. If we’re not able to crawl something – like Facebook or like the time we temporarily ran into problems with Twitter – we don’t want to depend on that data. Greg Boser: Social is such a great corroborating signal. The way social signals and links map together when they happen naturally is a very identifiable great pattern. It’s easy to go out and fake links or fake social, but big data comes into play when you mine the two together. Great, successful organic stuff works on both sides (links and social) to help search understand what offers real value. What’s the most important search factor in 2013? What about mobile ? Duane Forrester: Mobile is critical. In the next several years, we’ll move from 9 billion to 25 billion devices. Mobile is the No.1 area that’s most actionable for your site. Matt Cutts: If you haven’t thought about what your site looks like on mobile you better start. Also, site speed – making your site fast is good for users, and it gives an SEO edge. Annie Cushing: Look at webpagetest.org/ to test site speed. Matt Cutts: Social might be more talked about, but mobile will be important in years to come. Flash balls [flash parts of a site] are not good for mobile users – get rid of them! Duane Forrester: Ultimately, Bing follows what consumers want – if they love something, we want to know about it and it should rank well. Are you creeping along fast enough on mobile to keep up with consumers who are using mobile search? Only 4 percent of websites have implemented responsive design. Add value to your users by implementing it sooner rather than later. Matt Cutts: Look at your Google Analytics to see mobile visits versus desktop – I am guessing you’ll see the start of an exponential curve. Greg Boser: SEO is no longer about tactics, it’s about strategies. Duane Forrester: It’s important to have different skill sets. SEOs need negotiating skills, psychology chops, internal organization knowledge, usability, paid search, ROI. Janet Driscoll Miller: The goal is no longer ranking. If clients approach me and want a high ranking, we have to talk about goals. You want ranking to get traffic to get sales. What do you say to companies resistant to having a single person affiliated with content for authorship? Matt Cutts: That’s fair feedback. Google may look into company authorship, and then maybe people authorship underneath the company author umbrella. Greg Boser: Treat your authorship like it’s your resume as a person. If you invest in it as a brand, the content won’t rank less because an employee goes on to work for a competitor. You still own the authority for that page on your site. Duane Forrester: Bing is focused on Schema.org. Bing will not turn on Authorship just because Google does it. If you’re using rich markup, use tools to test it. MOST people get it wrong. Greg Boser: Only about 17 percent of sites show up with Authorship, and there are some inaccuracies. Janet Driscoll Miller: Google seems to infer Authorship from rich snippets. [She pointed to an example of a rich snippet that said “presented by” when the presenter wasn’t actually the author.] See if you can tweak your rich snippets for Authorship. Will there be a list of Google’s Top authors (like Google Trends for search)? Should you use company profiles for Authorship (ie: Verizon Bob) or employees’ personal accounts? Matt Cutts: I prefer to see real names – Verizon Bob gets annoying. As a business, let people have their personal brand. It doesn’t necessarily reflect badly on you, but have more than one person using Authorship so that if an employee goes, it’s not the end of the world. Duane Forrester: Add authoring content to a part of a career path instead of making it something employees are asked to do on the side while the company benefits. Be careful in case you need to explain that a face of a your brand is no longer with a company. Greg Boser: All Raven employees have a Twitter handle “Raven_” [Raven + their names]. They represent the brand and Tweet during the workday, but followers still get to know them personally. The company lets them build a brand during working hours and build their own personal accounts on the side. What’s the most important thing for SEO you want people to take away from this session? Duane Forrester: Invest in usability. When your visitors are happy with your site, search engines notice. This is the biggest missed opportunity. I don’t give a crap how you use H1 tags, if customers love you, Bing wants to know about you – focus on usability. Annie Cushing: Do NOT focus on keywords. Focus on the landing page experience. Rae Hoffman: The sooner you accept that SEO is more difficult now, the sooner you can get on a path to success. Janet Driscoll Miller: Stop looking at ranking, focus on rich snippets to get more traffic, and once people click, think holistically about usability. You are a marketer first and an SEO second. Sales, leads and usability matter. Greg Boser: Look at big data. And SEO is about strategy, not tactics. Check out more of Brafton’s SMX event coverage for more insights.